In an era of congressional gridlock and political stands determined by opinion surveys, historians are re-evaluating our 28th President, Woodrow Wilson. Born in 1856 in Virginia to a minister, Wilson was pre-occupied with creating a high-minded vision for the United States, a nation he believed possessed a unique moral force in a corrupt world. In the last fifty years, Wilson has gained new respect for his progressive domestic politics and his idealistic visions for world democracy. In a recent CSPAN survey of Presidential achievement, historians ranked Wilson a No. 11, just behind Lyndon Johnson (Abraham Lincoln, as usual, was first). Wilson was swept into office in 1912. In a three-way race, he took 41.8 percent of the popular vote and won 435 electoral votes from 40 states. With a strong Democratic majority in both the House and Senate, he was able to enact an unprecedented wave of reform legislation. This included the first permanent, progressive income tax, creation of the Federal Reserve System, the Federal Trade Commission and the Clayton Antitrust Act. He also appointed Louis Brandeis, the first Jewish Supreme Court Justice. Although he campaigned for re-election in the summer of 1916 on the slogan, “He kept us out of war,” aggressive German actions (and increasing, desperate pleas from Britain and France) forced Wilson to make a declaration of war on April 2, 1917. He then went on to successfully oversee the rapid conscription, training and deployment of some 1.5 million troops in Europe within eighteen months. At the Paris peace talks in 1919, Wilson proposed the League of Nations, precursor to the United Nations and advocated for establishing independent, democratic nations after the break-up of the Russian and Austro-Hungarian empires. His strident lectures to French and British leaders at the peace conference was a precursor to an era of American moral vanity and overreach in international affairs. Unlike later activist Democratic presidents such as Franklin Roosevelt and Lyndon Johnson, who worked the telephone and dispensed political favors with Congressional leaders, Wilson was a shy introverted man, who avoided the press and spent much of his time in reading and contemplation. A key reason he was able to enact so many progressive measures was the strong support he enjoyed from the Southern Democrats who wielded enormous power in Congress and who considered him a sympathetic colleague. Wilson’s father was a Presbyterian minister and a chaplain to the Confederate Army. Although he would be mostly educated in the North and would earn a national reputation as president of Princeton University in New Jersey, he retained many Southern values of elitism, close-knit family and white racial superiority. In the first half of the twentieth century, the Southern states were a pillar of the Democratic Party. As President, Wilson readily acceded to Southern politicians’ demands for the segregation of the federal government workforce, including the Post Office, Treasury and Navy departments. Thousands of black workers were thrown out of work, hundreds of others denied promotions. They were mostly replaced by white workers named by Southern politicians. During his second term, black enlistment in the Armed Forces was perceived as a threat by many white supremacists and the lynching of black men surged across the South. Wilson privately expressed shock, but declined to take any federal action. When the U.S. Army finally deployed in Europe, he rejected pleas from black leaders that their men be integrated into regular combat units. Instead, black infantrymen fought in segregated battalions, often under French command. 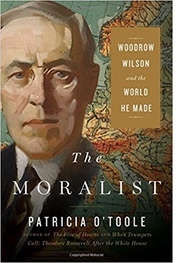 The book’s title, The Moralist, suggests the author’s take on Wilson’s political achievements. O’Toole states that his moral ideology was “more secular than religious, the effect of his long education in history, government and the law.” Although he often referenced God in his speeches, Wilson’s view of government was anchored in secular thought, particularly British parliamentary law. Wilson had written widely on government, including authoring a widely used college textbook. He saw the United States as a unique, nation with an idealistic Constitution that required its leaders to lead with “moral force.” As a result, he rarely acted as a traditional, flexible politician, ready to compromise and trade favors to get a bill passed. Rather, he saw himself, a man of superior education and intellect, as one who was destined to lead the masses. Confident in his erudition (he is the only President to earn a Ph.D.) he sincerely believed he knew what was best for the nation and, after World War I erupted, the world (e.g. The 14 Points and the League of Nations). Privately, he told his political associates that it was better that blacks be segregated, since they could not yet compete successfully with whites in the job market. He was unable to connect his vision for new, liberal democratic nations in post-war Europe with the cruel suppression of African-American rights occurring in his own country. O’Toole’s other reporting of Wilson’s political career is balanced and often critical. She notes many hypocrisies and frequent prevarications. His stubbornness and refusal to compromise limited his political achievements. The most significant was his refusal to accept any changes to the treaty which would have brought America into the new League of Nations. The author shows that if had accepted a few minor amendments and staged a face-saving negotiation session with Republic senators, he might have secured passage of the measure. Instead, Wilson embarked on a grueling, nationwide speaking tour. On Sept. 25, 1919 in Pueblo Colorado he suffered a massive stroke. He was never able to speak or write normally again. He finished his term in a beleaguered, secretive White House, protected by his second wife, Edith Bolling Galt and a coterie of advisors. The story of Woodrow Wilson’s doomed presidency has aspects of a great tragedy. Patricia O’Toole’s carefully crafted account is always interesting and insightful and becomes a fascinating, page-turner in the later chapters when the inflexible, idealistic President has to come to terms with the horror of the Great War.